At the end of last year I did a quick improvised survey of our active BusinessObjects customers and was surprise to find that about 35% of them were also using Tableau. Most just had a few copies of Tableau desktop, but some had Tableau server too. In all cases they had no plans to replace BusinessObjects; they were just using Tableau for different functions alongside. These functions were mainly self-service data discovery for power users and data visualization/dashboards. The one thing they all agreed on was that Tableau was not a good BI reporting solution. However, most expressed they were planning to add more Tableau users. None of the BusinessObjects Tableau customers I spoke with had implemented any real integration between the two product sets but several were running Web Intelligence queries and exporting to Excel that was then used as an input source to Tableau either by importing or cut and pasting. Most expressed a desire for better integration so they could leverage their BusinessObjects universes and reports in Tableau. 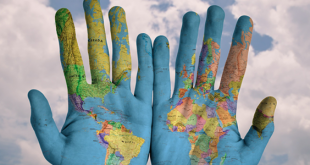 A few had tried using some third party ODBC connector products that allow Tableau to connect to a BusinessObjects universe and one had tried using an Odata connector but these customers expressed that these connectors were sometimes limited. Based on all this feedback, InfoSol decided to see if we could provide a solution that would allow for an automated and seamless integration between Tableau and BusinessObjects. The InfoBurst platform already provides a reliable and proven way to automatically schedule, burst and distribute BusinessObjects reports to a wide range of destinations in a variety of formats, so it was a natural choice to use to push BO content into Tableau. 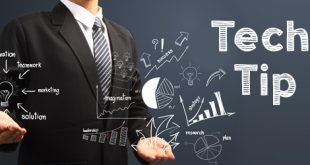 It was also decided to push refined report content rather than just provide access through a universe since many users add both business and report logic that would be even more useful as a source to Tableau. And so, InfoBurst Tab was conceived. InfoSol worked with several large organizations using both BusinessObjects and Tableau to understand their main use cases for integration and to help both guide and pilot the solution. 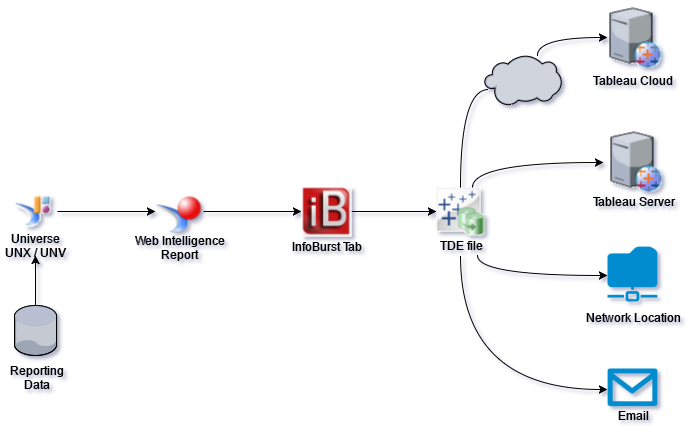 InfoBurst Tab allows a BusinessObjects user to leverage the investment they have already made in both their universes and Web Intelligence reports to automatically schedule and push content direct into a Tableau Data Extract (TDE). The scheduling can do both time and/or event based and the Webi report can be intelligently burst or split allowing filtered content to be pushed into multiple TDE’s. The resulting TDE can be automatically delivered to a variety of destinations including Network share folders, Tableau server (on premised or in the cloud), SharePoint, FTP and email. InfoBurst Tab can also automatically schedule and burst BO content to TDE’s to both publish and refresh them direct to Tableau Server, while also dynamically naming the name files. InfoBurst has a powerful macro builder that can use original file name, filters, date, time to dynamically name TDE’s something meaningful and easy for the user to know the content. The Tableau user just goes to the appropriate folder on the Tableau server to use TDE’s with content being automatically refreshed from BusinessObjects without ever touching BusinessObjects. The other really cool thing you can do with InfoBurst Tab is to single pass burst Tableau content out to as well. As mentioned earlier, you can take a Webi report and split the output to produce multiple TDE files each with distinct content. For example if you have a budget report, you can burst the report by Regional Manager and have InfoBurst and IB Tab produce separate TDE files, one for each region, and then deliver each region’s budget as a TDE to each Regional Manager. InfoBurst has a rich array of distribution options and can provide an automated way for Tableau desktop users to distribute their dashboards with or without Tableau server. 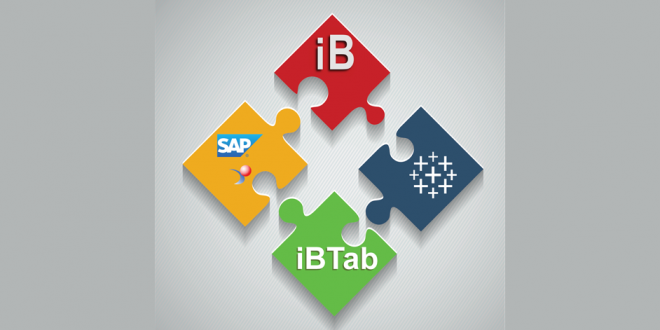 All in all InfoBurst Tab provides a great way to leverage your BusinessObjects investment while controlling the consistency and accuracy data feeding into your Tableau dashboards. If you are a BusinessObjects user using Tableau or looking to use Tableau, you should definitely check it out. Note that if you are combining InfoBurst with data from SAP BW, then this is only allowed if customers own the SAP OpenHub license which allows extracting data out of BW. Thanks for your comment Blair. Just for clarification: if a client uses Webi through BICS or BeX to pull data from BW then they need an SAP OpenHub license?